Double glass doors lead into the building, a dark blue carpet with the NYPD logo on it leads toward the Duty Desk. 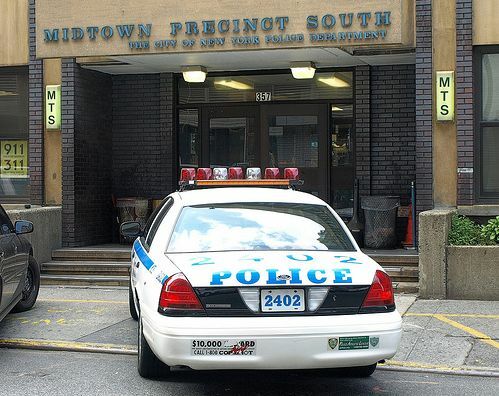 On the white-washed brick wall behind the desk hands a metal NYPD shield with the precinct number on either side of it. The floor is white linoleum with black flecks, meant for rugged use. To the left of the Duty Desk is an area for making minor statements and complaints. To the right is a low wall that hides the cubicles and offices from public view. Further down on the right are the holding cells and interrogation rooms.